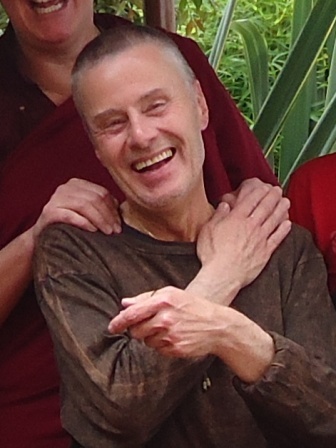 Alan Joyce, founder of the Dharma Foundation in Bogotá, has been working with dying children in Colombia for 12 years. The former mechanical engineer and his Colombian fashion designer wife, Monica, have been married for 30 years. Ten years into his Buddhist life he stopped manipulating the Dharma to suit his own ego – “I can cheat on my wife but I’m going to be honest about it because we Buddhists don’t tell lies.” It was around then that his work with dying children began. You come to a realization that everyone is suffering – the doctors, the mothers, the children – it’s very difficult to say who is suffering more. It’s easy for us to open our hearts to children with tumors and leukemia, but you realize that everybody is in the same situation. One of the biggest errors, I think, is to compare suffering. It’s easy to say to my 17-year-old daughter, for example, who has just broken up with her boyfriend and is miserable, “Don’t complain so much, it’s natural, it always happens – there are children dying of cancer in the Foundation.” Her suffering however may be equally as great, possibly greater than the children in the Foundation, who may be more prepared for what they are going through.